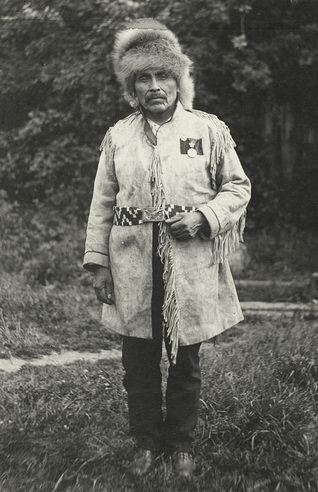 Chief Joe Capilano, known also by his Squamish name Sahp-luk, was a Squamish leader and activist during the late nineteenth century. According to James W. Morton's Capilano: The Story of a River (1970), Chief Capilano "was first known to the white settlers around Burrard Inlet as Hyas Joe, meaning big, strong, powerful, and later as Capilano Joe, to distinguish him from all other Joes up and down the inlet" (25). Morton suggests that Capilano Joe was chosen to be chief by the church, as he had been successful at leading members of the Squamish nation towards Catholicism. In 1906, Chief Capilano Joe, along with the chiefs of the Cowichan and Bonaparte nations, decided to travel to London, England to protest King Edward VII about destructive changes taking place in Canada with regards to Indigenous land and fishing rights. "Before his departure for England, his wife's cousin in Musqueam had told Joe he must have a name - a family name, which the Indians greatly respected. She told him he could use the name 'Capilano,' but he must return it when the trip was over. Joe, of course, never did. Indeed, he soon became Chief Joe Capilano. Born Sahp-luk, he became successively Hyas Joe, Capilano Joe, Chief Capilano Joe, and finally Chief Joe Capilano" (Morton 30). Chief Capilano met E. Pauline Johnson in 1906. Once back in Vancouver, the pair developed a friendship, and Chief Capilano, along with his wife, Mary (Lixwelut) began sharing his/their traditional stories (in a mix of Chinook and English) to Johnson. The stories included in Legends of Vancouver are based mostly on Capilano's stories of the Squamish people. While the book was ultimately given the title Legends of Vancouver, Johnson initially expressed a desire to name the book after her friend, Chief Joe Capilano. The Pauline Johnson Trust chose to use the title Legends of Vancouver instead of Johnson’s proposed title, in a likely attempt to promote the city and produce a text that interested tourists. However, one edition of the text, published in 1913 by G.S. Forsyth under the imprint of The Thomson Stationary Company, was, in fact, rebound under the title Legends of Capilano.